Cross orbweaver, note white spots making an inverted cross on the back of her abdomen. Its body is about 3/4 inch long. With Halloween in mind, I set about looking for something creepy to photograph. According to some recent research, we humans are apparently programmed from a very early age to react to spiders and snakes. Looking for something dramatic to shoot, camera and flashlight in hand, I took a nocturnal tour of my backyard. This the season for big spiders. The local females have grown large, accumulating enough body mass to support making a healthy brood of eggs to overwinter and hatch in the spring. 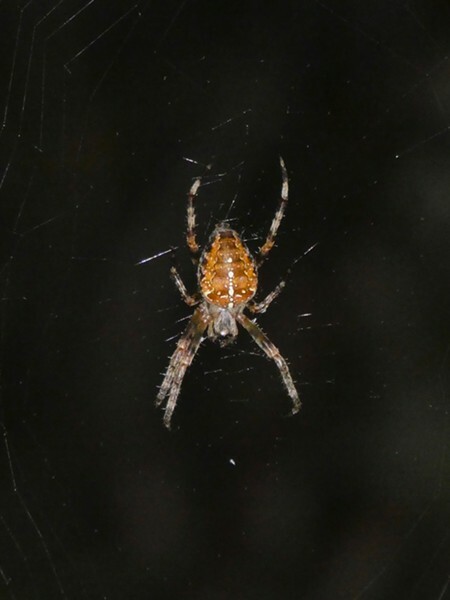 The two I see the most of lately are the cross orb weaver (Araneus diadematus), which is a European import that's made itself at home in many states and my yard, and the native redwood spider (genus Callobius).